Nottingham Panthers defenceman Stevie Lee admits it’s been overwhelming to see the amount of support he’s had as he looks ahead to his testimonial tonight. The 28-year-old will be honoured by the club and former team-mates as fans will also pay tribute to the long-serving GB defenceman. And Lee is looking forward to the event at the Motorpoint Arena, especially catching up with the many ex-team-mates that have jetted in especially. “It’s overwhelming and not just the players that have taken the time to fly over to take part, but those who have helped out from sponsorship to people doing airport runs,” he said. “It’s absolutely incredible and I’m very grateful for the support that’s gone into this event. “I’ve been catching up with the guys as they’ve been coming in. It’s exciting to see them again, some of whom I haven’t seen in a long time and every memory I have of them have been good ones. “The fans have always been great to me and I keep coming back to it, but it’s a great place when the arena is loud and pumping and it gives you that little bit extra. 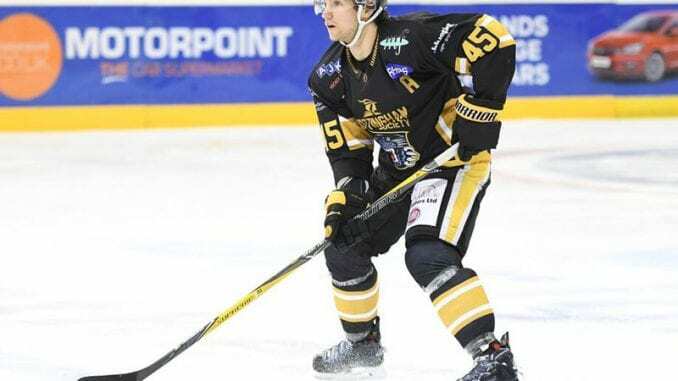 Lee first signed in 2009 and has won it all in his time at the club, signed initially by Corey Neilson, who returns to Nottingham since leaving for Germany in the summer. Other former colleagues coming in to take part include Craig Kowalski, Jordan Fox, Sean McAslan and David Ling, joining David Clarke and the current Panthers squad. And he recalled his initial impressions when he made the move from Guildford Flames as a teenager and revealed if he ever thought he would still be there ten seasons on. He added: “My first impression when I first went there was how professional it was, the arena was great and the dressing room was spotless, which Adam Goodridge takes very good care of. “The organisation itself were amazing and very welcoming and players such as David Clarke, Matthew Myers and Danny Meyers there to take care of me. They were great from day one and made me feel at home straight away. “When I first signed, I always dreamed I would be here at this stage. It’s always been a great place to play and I’ve never had an aspiration to play anywhere else. “To pick one favourite moment is hard, so I would have to pick two. When we won the treble in 2013 was pretty special and a real highlight. Unlike other testimonials, Lee’s big night will see a round-robin of four teams, playing each other once, three-on-three hockey for 10 minutes on a running clock. The top two from the group will meet in the final and with an auction and an after party, it’s sure to be a great night for everyone involved with Nottingham Panthers.